★ LOOGAROO ★: ACTIVISION SURPASSES EA! That's right folks! It's taken a decade to finally surpass the giant called EA to fall and for Activision to surpass them as the leading developer!! 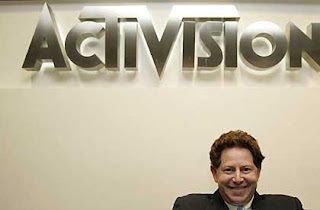 Activision's shares have jumped 54% over the last year and since they have a lot of homegrown franchises that are currently climbing the sales charts such as "Call of Duty," "Guitar Hero," and "Tony Hawk." Not bad for an all star lineup if I do say so myself! I tip my hat to you boys and girls at Activision. For the full press release click here! Well done on the accomplishment!